It's true I am in LOVE with Valentine's Week! I am a hopeless romantic and all things sweet and lovey dovey make me happy (and yes pink is my favorite color)! I really enjoy baking heart shaped sweets every year and attending Valentine's parties especially now that I can share in the fun with my daughter Ava! 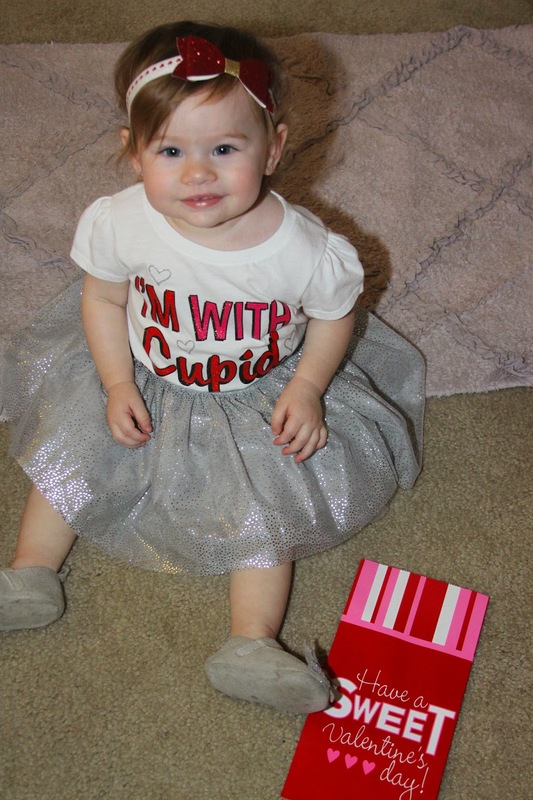 This year we are attending a Valentine's themed luncheon I am planning with our FRG and a Ava's music class is having a Valentine's exchange! 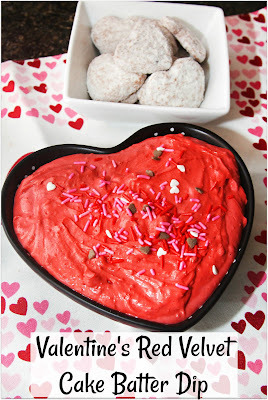 I decided to make this Valentine's Red Velvet Cake Batter Dip for the luncheon dessert table. Truly I wanted something easy and portable but also sweet and delicious that everyone would love and I found just that with this recipe. Better yet, it's a healthier version using fat free Greek yogurt instead of cream cheese and whipped topping. I had leftover shortbread dough from my Valentine Cranberry Sandwich Cookies that I had frozen a few weeks ago and using my cookie stamp and heart shaped cookie cutters and red sugar sprinkles I made the perfect dipping cookies to go with this dip. I also like to serve with fruit and vanilla wafers. Check out the recipe video here. 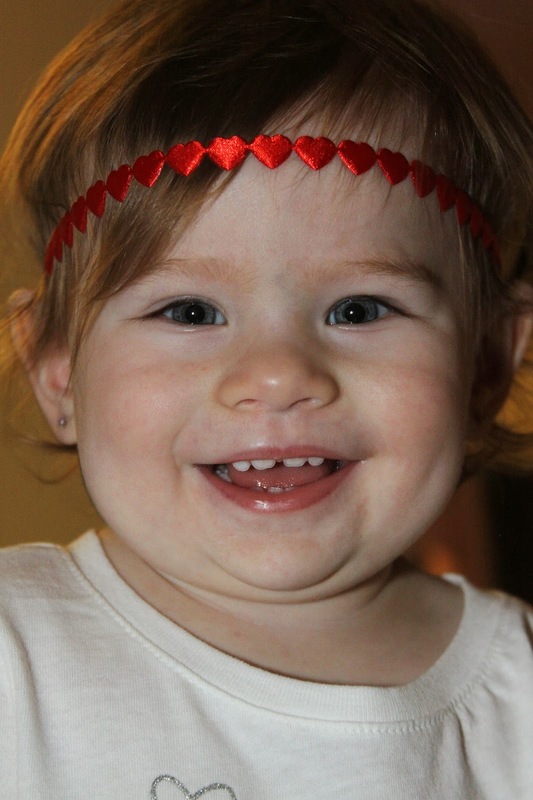 My sweet Ava, 15 months. Valentine's week 2014. In a bowl, mix Greek yogurt, cake mix and powdered sugar. Place in serving bowl and enjoy with cookies or cut fruit! I served mine with my favorite shortbread cookies in Valentine's shapes with red sugar sprinkles! Valentine's treats don't get much easier than this! Three ingredients mixed together make a delicious dessert dip! Mix 2/3 cup cake mix, 2 cups Vanilla Greek yogurt, and 3 tbsp powdered sugar in a medium bowl. Make sure to stir well from the bottom and break up any bits of dry cake mix. I just love that gorgeous red color! My fun new "Made With Love" cookie stamp from World Market. so I rolled it out and used my cookie stamp and heart shaped cookie cutters to make small cookie dippers! Homemade cookies or powdered store bought- they are all delicious dipped in this sweet treat! Valentine's Red Velvet Cake Batter Dip is a delicious treat for your friends, sweetheart, or kids this Valentine's week! Lovely blog! I love to bake, but I haven't had much time. I think I'll peruse around a while and drool a bit. We make something similar at our house...but yours looks amazing! I'll have to give it a try!